Including four DVDs and a box of cupcakes. 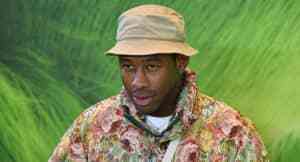 Last week, while appearing as a guest on The Late Show, Tyler, The Creator mentioned that he was a big fan of Elizabeth Taylor. However, he appeared surprised when Colbert mentioned that the late star was an accomplished actress, saying he was mainly a fan of the jewelry she used to wear. Clearly sensing a fan with some blank spots to fill, Colbert subsequently sent Tyler a collection of Taylor's movies on DVD alongside some cupcakes. The care package included copies of Suddenly, Last Summer, BUtterfield 8, Cat On A Hot Tin Roof, and 1963 classic Cleopatra. The Flower Boy rapper shared his haul on Twitter alongside the caption: "THABKS AUNTIE COLLLL @colbertlateshow." Tyler's Flower Boy album earned a No. 2 debut on the Billboard 200 chart this week, shortly behind chart-topper Lana Del Rey with Lust For Life.